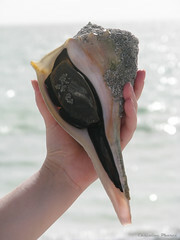 The lightning whelk seashell (Busycon sinistrum) lives anywhere along the coastline of Florida. When I visited Sanibel Island there were many living whelks just offshore. I live on the East coast of Florida and have also found many lightning whelks – small ones – with hermit crabs inside. Don’t collect shells which are inhabited by any living creature, whether it is the mollusk (as in my photo here) or a crab. Take a photo and put it back where it was found. The lightning whelk can reach a length of around sixteen inches. It has a long opening, or aperture, down the entire side. 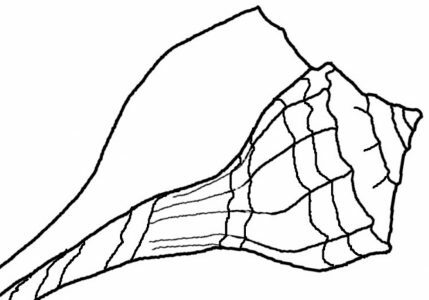 Seashells that have a similar appearance are the knobbed whelk, channeled whelk, and pear whelk, but the lightning whelk has a unique characteristic. It is sinistral, or left-handed. The aperture is on the left side and this differentiates it from other similar gastropods. It is very easy to see when holding the shell from the pointed bottom. In my photo below I compare a juvenile lightning whelk to another seashell. That little shell was a mystery to me until I realized it had a left side opening… then suddenly it dawned on me – lightning whelk! See my own pictures of this seashell at the Lighting Whelk page. Previous Post Identifying Your Seashells, Where to Start?